This Interview with Naw B--- describes events occurring in Bu Tho Township, Hpapun District, including land confiscation and livelihood challenges. Naw B---‘s and other villagers’ lands were confiscated by Tatmadaw Infantry Battalion# 19, after the ‘four cuts’ policy was introduced in the 1960s. 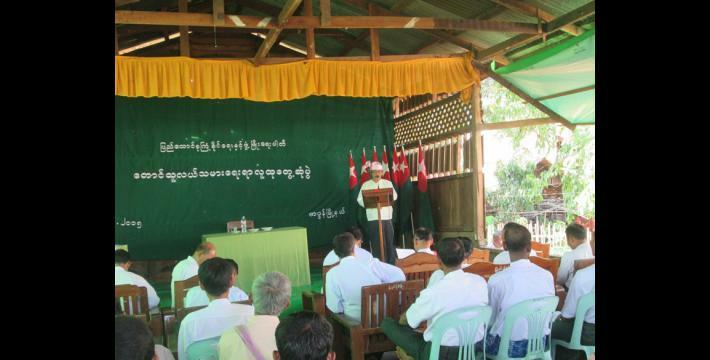 Tatmadaw constructed an army camp and other buildings on the land that was confiscated from Naw B--- in M--- village, Bu Tho Township, Hpapun district. Naw B--- also mentioned in the interview that she tried to submit the case to the Burma/Myanmar government, through the government-appointed village head, but there has been no reply to the villagers who had their land confiscated. This has significantly impacted the villagers’ livelihoods, as their lands have not been returned. The following Interview was conducted by a community member trained by KHRG to monitor local human rights conditions. It was conducted in April 2015 and is presented below translated exactly as it was received, save for minor edits for clarity and security. This interview was received along with other information from Hpapun District, including 10 other interviews, two situation updates, 310 photographs and 15 video clips. Mu Ghar, what is your name? My name is Naw B---. My husband’s name is Saw C---. We are husband and wife. I live in H--- village and my husband lives in M--- village. What about the village tract? Pa Heh village tract, and my husband is from Hkaw Poo village tract. I have to do farming. What kind of farming do you do? Do you also work on [crop] cultivation? Yes, [I did it] for some years but now I’m getting old so I do not do it anymore. Have some of your children got married? Yes, four of them have got married and two of them are single. Do you have enough rice, as you are working on the farm? We have enough rice some years, but not enough every year because we hardly collect 100 baskets of rice in a year. My land, which has been confiscated by Tatmadaw, can provide 300 big tins of rice as it is five acres of land. How many households are there in H--- village? If we count all households in there it will be around [censored for security]. What do they do for their living? Most of them work on cultivation. What is the percentage of villagers who work on cultivation? The villagers who work on cultivation also work on the farm. They are the same numbers. Do they have enough rice in each year? Some villagers have enough rice but some cultivators do not have enough rice. If we have enough rice we share some rice with them. The villagers who do not have enough rice, what do they do? Some villagers who have enough rice share one big tin of rice with them, but if they [the villagers without enough rice] still don’t have enough rice they have to buy the rice in A--- [village] and in other places. How many villagers do not have enough rice? Many villagers in H--- [village] do not have enough rice. So most villagers [who] do not have enough rice are [working as] cultivators? Some are cultivators and some are farmers. For the villagers who work on very large farms [they] have enough rice, but for me, some years we do not have enough rice so we have to borrow from the other villagers. How many [big tins] of rice can your farm produce? 130 big tins, but that amount of rice [is] not enough for us. So how many members [are there] in your family? I have six members of my family, and if we include my son-in-law and three grandchildren it will be around ten people. Why can’t the [farm and cultivation workers] produce much rice? Farmers cannot produce much rice because the paddy [rice] dies and is not good. Sometimes rats destroy the paddy; therefore, we collect a lot less rice. Did the lands that were confiscated in the past include your land? Yes, it included my husband’s land, which is based in M--- [village]. Where did your husband live in the past? He lived in M--- [village]. Did he purchase the land by himself or did he inherit it? His aunt sold the land to him. So he purchased it by himself? How many [acres] of your land have been confiscated? How much paddy can five acres of land produce? The five acres of land can produce 300 big tins. Some years it can produce 290 big tins of paddy. What do you plant on the land? In the past when we worked on our land we only planted paddy [rice], but after the Tatmadaw confiscated the land they planted paddy, peanuts and other things. We only worked on our land for four years and then the Tatmadaw confiscated the land when the ‘four cuts’ policy [was introduced]. After that we did not dare go to the farm anymore, instead we reclaimed the land back [requested that the land was returned but] they [Tatmadaw] did not return the land to us. Do you still have the land title? Yes, we still have [the land title] with us. Do you remember when your land was confiscated? It started when [there was] heavy fighting. Did you rent the land or [did] you work on it by yourself? We worked on it for one year and then rented it to the Shan people who live in M--- [village]. My land is located in M--- [village] and we took the water from the M---- River. What is the village tract of M--- village? Who confiscated your land? Were they armed actors or rich men? The armed actors confiscated my land. What kind of armed actor? [Infantry Battalion (IB)] #19, but I am not sure if this battalion still exits or not. I think now it has changed to [Light Infantry Battalion (LIB)] #434. After they confiscated your land what did they do with the land? They constructed their army camp and houses on the land. Do you know their battalion and battalion commander? So the people [Tatmadaw battalion] who are based on your land at the current time are IB #19? I do not think so. I think you can follow up by yourself to get more information. Now there are many battalions, so I do not know [which one is on the land]. Where did you live in the past? I lived in H--- [village]. My husband lived in M--- [village]. After he got married to me, we went to work on the land for one year. As [far as] you know, the people [Tatmadaw] only confiscated your land? Not only my land, [the confiscation] included other peoples’ land. 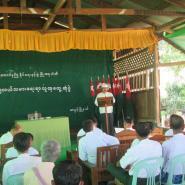 Mu Ghar, after the ceasefire took place, have you ever heard that Tatmadaw has returned land back [to the villagers]? I never heard of that. We did not even dare to reclaim our land back. We also asked the people [Karen National Union (KNU) Agriculture Department] to measure the land for us but they [Tatmadaw] did not permit them to measure [the land]. After the ceasefire took place did you ever submit the case to [the Burma/Myanmar government-appointed village head], to regain your land? Yes, we submitted the case to the [government-appointed] village head but until now we have not heard any result from them. What is the name of the [government-appointed] village head? I do not remember the name of the [government-appointed] village head. The village head lives in B--- [village]. You do not know his name? No, because I did not note down [his name]. When did you go to submit the case? We went to submit it two years ago, in 2013. You went there [to submit the case] in 2013? At that time, how many land owners went to submit the case? Over [between] 10 and 20 people. So the lands of other villagers have also been confiscated by the Tatmadaw? Yes, the Tatmadaw confiscated their land too. They [the Tatmadaw] confiscated their land like they confiscated our [my] land. We do not dare to reclaim the land. Did you go submit the case by yourself or did the [government-appointed] village head ask you to go? At that time, the people [the government-appointed village head] said that because the ceasefire took place they might give our land back; therefore, we went to submit the case. Most of the land owners who went there were Karen and Shan [ethnicities] from H---, J---, K--- and L--- villages. Also, 20 people were from Karen [villages], and many other Shan people also went to submit the case, but until now we have not heard anything from them. So after you met with the [government-appointed] village head what did [he/she] say to you? 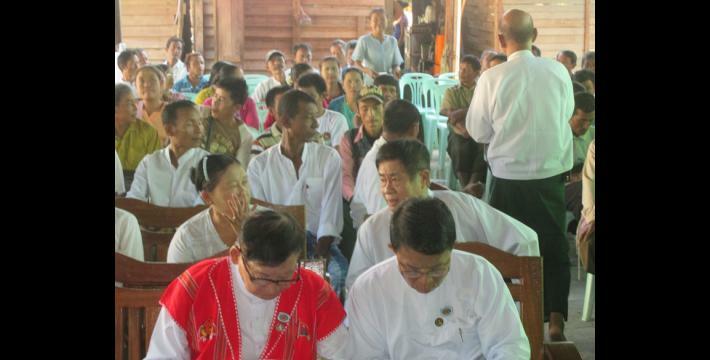 The [government-appointed] village head said that if I submitted the case then maybe they [Tatmadaw] would give my land back; therefore, we submitted the case. Even if they were not [going to] give our land back we had to submit the case. After 2013 did you hear anything from them? Have any other groups come to question you about the land issue? The people [KNU Agriculture Department] here told us that they would measure the land for us, but they [the Tatmadaw] did not permit them to measure the land, therefore, they cannot do anything. Which group were they from? Saw H--- came to tell me. Does he [come] from the KNU [Agriculture] Department? Yes. He said that the ceasefire has now taken place and then they asked us to measure our land. They had measured the other villagers’ [lands], which were not included in the land confiscation, but for the land which had been confiscated by Tatmadaw, they [Tatmadaw] did not allow them [the KNU] to measure. Where does he [Saw H---] work? Did he ask any of you about your land? He asked to measure our land. He went to meet with the Tatmadaw but they did not allow him to measure the land. When did he come to question you? Recently, because they [KNU Agriculture Department] have started [to] measure the land only [in] this year . Did they only measure the lands which have been confiscated? No, they measured all of the land. They started to measure the land in which year? Was it not in early 2015? Oh yes, in early 2015. Did they only measure the land in the flat area, and not in the mountain side like V--- [area]? No, they said they would measure the land in V--- [area] next year. So [during 2015] they only measured the land near the town? 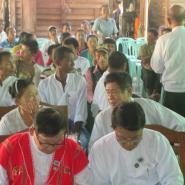 Yes, they measured only the Karen villagers’ lands, which are located near the town [the flat land area]. They measured the lands for all [those] villagers and created land grants for them. As for my land, we wanted to measure it but Tatmadaw did not allow us. What did they do with your land? Did they grow paddy [rice] or vegetables? They built houses and kept it as their place. Do you know their battalion? I do not know. The people told me that Tatmadaw’s base is on my land. When I went to submit the case the people told me [the battalion numbers], but I do not remember them. You did not note it down? No. If you go to M--- [village] and ask the villagers there [they will tell you] that the Tatmadaw [constructed their army camp and houses] on Saw C---’s farm, and many villagers will tell you [this]. You can also ask the villagers in N--- village. How many years have you worked on your land? We worked on our land for two years and then we rented our land to a Shan villager. So did you collect money from [the Shan villager] or [did you collect] paddy? We rented the land and we asked for paddy, and we also had to pay tax. You said you went to submit the case in 2013, so did you ever go to meet the [government-appointed] village head in 2014 and 2015? No, we never went because we had not heard anything from them. Is there any land from other villager’s [that is] in Hpapun [Town]? The villagers in H--- village do have land in there. So only your land is based there? Yes, because my husband bought the land and he also lived in M--- [village]. So your husband purchased it? Yes, he purchased it from his aunt because his aunt sold the land to him. His aunt said that she did not dare to work on her land because the land was located near the main road, and it was the time of the ‘four cuts’ policy. How much did he purchase the land for? Is that in Myanmar or Thai currency? Myanmar currency [kyat]. In the past Myanmar currency and Thai currency had the same exchange rate. Did the [government-appointed] village head ask you any questions when you went to submit your land case? No, [the government-appointed] village head did not ask any questions because [he/she] already knew that we went there to submit the land case. After you submitted the case did you hear [that] any of them [villagers] got their land back? I have not heard [that] any of them [have got] their land back. Saw H--- asked the land owners to go with him, so he could measure the lands that had been confiscated by Tatmadaw, but that did not have any [Tatmadaw] buildings on them yet. None of the land owners dared to go [and measure the confiscated land], and Tatmadaw also does not allow us to measure the land. You said they went to measure the lands, so where did they measure? They went to measure the land starting from M--- [village], and in the lower part of M--- village such as O---, P---, Q---, R--- and S--- [villages]. When they [Saw H--- and the KNU Agriculture Department] measured the land, did the villagers go with them? Yes, some villagers went with them. You said the villagers did not dare go with them, right? The villagers dared [even though they were afraid] to go with them, but Tatmadaw did not permit them to measure the land. They [KNU Agriculture Department] wanted to create land grants for the land owners because in the past most of the farmlands did not have land grants. So they went to measure the land only this year ? Yes, in this year because in the past [before the ceasefire] they [the KNU] did not dare go there to measure the land. Did you go to submit the case in order to get your land back, or to get any other [form of compensation]? We submitted the case in order to regain our land, but they [Tatmadaw had] already built their houses and army camp [on our land]. Therefore, we are not able to do anything. Even if they are not going to give our land back they should at least give us compensation, but they did not give us anything. Even though they built their houses [camps] on the land, they did not inform any of the villagers. Thank you so much for answering my questions about your farm that has been confiscated, as you know. I have the land grant with me if you want to have a look. Do you have anything [else to say] that I have not asked you [about]? Yes, about my farm. Even if they are not going to give our land back they should at least compensate us. Now we are getting old so if they give us compensation we can use it. Now we have lost everything [because of the confiscation]. They [Tatmadaw] already confiscated our land, and we do not dare to go and check our land because we are afraid of them. How many groups of people have come to talk with you about the land issues? Only Saw H--- and you. Thank you very much Mu Ghar. Mu Ghar means ‘Aunt’ and is a familiar Karen term of respect attributed to an older woman; it does not necessarily signify any actual familial ties between the two people. In Burma/Myanmar, the scorched earth policy of 'pya ley pya', literally 'cut the four cuts', was a counter-insurgency strategy employed by the Tatmadaw as early as the 1950's, and officially adopted in the mid-1960s, aiming to destroy links between insurgents and sources of funding, supplies, intelligence, and recruits from local villages. See Martin Smith. Burma: Insurgency and the Politics of Ethnicity, New York: St. Martin's Press, 1999 pp. 258-262. All conversion estimates for the kyat in this report are based on the 26th January official market rate of 1355.15 kyat to US $1.